Parting Nome, an 800 mile run, Ice, wind, fog and a boat load of luck. Read more "Parting Nome, an 800 mile run, Ice, wind, fog and a boat load of luck." Read more "71°23′20″N 156°28′45″W -Coincidence?" For those of you who have been utilizing the “track us” link from the blog and have been following Empiricus after she set sail from Nome, AK, you have likely noticed that we have cleared the Bering Straight and are now seemingly redirected. Never to fear, this is the nature of saling, moving about along the route. Rest assured the captain, crew and vessel are safe and sound. They are hove to in Kotzebue Sound, awaiting a favorable weather change. For me, sailing was defined in times such as these. Times when sailing wasn’t quite what I thought it would be. I believe that many people (myself included) when asked to imagine what it must be like to sail conjur up images of vessels with their sails billowed in wind-filled glory, transporting those aboard across vast bodies of water in the mid-day sun. I must admit, sailing is rich with moments much like this and the times that I’ve sailed this way are emblazoned in my mind. But from my recent open ocean experience, this was not always the case and this taste of the less exhilarating side of sailing is what comes to mind as Empiricus awaits the whim of the winds in Kotzebue Sound. I was well aware that my imagination of what sailing would be like surely paled in comparison to the “real deal”, but not only did it pale in comparision, it left out entire pieces of what makes open ocean sailing so magnificant. My imagination gyped the real deal! True, it is awe inspiring and empowereing to stand at the helm of a 50 foot vessel in sloppy seas and strong winds. You feel the power of mother nature. You taste her bitterness in the sea spray hitting your face as you work to maintain a heading that keeps you on course. As the biting winds prick at your face you almost feel as if she is taking jabs at you, telling you that all your knowledge and skill cannot assist you in the very thing you have spent so much time understanding. This was not the image of sailing I had so elaborately crafted. At time, it almost feels like a battle as you fight to be the victor of the elements, keeping your vessel on the ocean’s surface instead of under it. 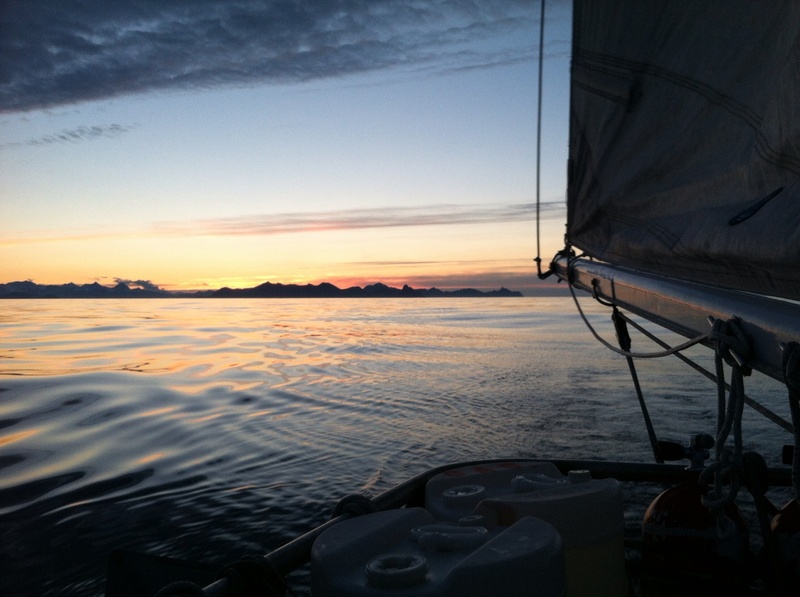 That was my initial feeling, late one night off the coast of Kodiak Island. I felt like if I could make it through the captain’s respite hours, I would have mastered something, conquered something, been the victor of SOMETHING. But what? The sea? The wind? The helm? Ah Yes! I could master the helm! In one night! Something about controling a large multi-ton vessel makes you (actually made me) a bit nonsensical. Right…sure…, well at least I could be a good helmswoman, right? I was initially bewildered that the captain would leave me alone at the helm in such conditions, but pleased in some way that he trusted his teaching ability and my ability to absord and apply what he had taught me thus far enough to go into the cabin to get the rest he needed while I took the helm. As I struggled to maintain our heading and my balance, crashing and rocking about on the ocean, I was enamored with the power I held in my hands. What a racket I was making down below I’m sure, but I surged Empiricus on, riding high on the waves with her stern in the air, bow pointing down and gliding into the water, only to rise up on the next swell and do it again. In some way it was remniscent of my Hawaii days atop a surf board, much warmer water, much calmer conditions and a much smaller board. Still, I was hooked, sailing was exhilarating. Yet I had yet to learn the lesson that endeared me to sailing the open ocean. We’ll fast forward to the eve that this photo was taken. Calm seas, majestic skies, just a kiss of wind…ahhh, a sail uneventful enough for me to snap this photograph. I remember feeling that it was so nice and calm and BORING! I longed to feel “in control” of something. I welcomed the calm and the leisure it provided but wanted something to make my muscles tense and my heart rate quicken. After all, that’s adventure, right? Same vessel, same ocean, same person, but entirely different conditions. Now I felt like taunting mother nature, I felt like asking her, “was the other night all you’ve got?” Bold, I know, foolish, most certainly. Herein lies the lesson. Sometimes we chase things so hard and so fast, only to get there quickly and wait idly by for the “next big thing” to take our breath away and jump start our next adventure. We (and perhaps its just me) desire the thrill of adventure to be, well, THRILLING! To be filled with tales of fast paced action and last minute decision making, daring and precarious, unexpected and trying. That’s the stuff of great sea tales, isn’t it? Well, it is, but thats not all the stuff of living at sea. When your goal is to chase your dreams, you’ve got to enjoy the chase, because your dreams are ever evolving as you learn new things about yourself, discovering that as life hands you knew challenges, it hands you new supports as well. Understanding this while under sail bettered my sailing ability. I found less desire to conquer, control, manipulate and react and was more inclined to listen, look around, appreciate and respond. I found sailing in the later frame of mind often meant taking the pace down a few knots, but by doing so enjoying a smoother ride. It encouraged me the take advantage of the opportunity I had to enjoy my growing ability, to worry less about getting things “just right” and to experience a land and waterscape that has been largely untouched. I sat with mother nature and she showed me her majesty all around me. THIS was adventuring. The adventure wasn’t in the record that Empiricus sails to make or in the ocean or even in the vessel herself. The adventure was in me. As I believe it is for all those aboard Empiricus. As with so much in life, the tools we use to build our dreams, the paths we take to follow our passions, they are but vessels that carry us between destinations. The journey, the adventure is in each of us. We have the whole world or our own city, town or village to begin our very own unique, long lasting, continually fulfilling adventure, because the adventure is where ever we are! Safe travels and thank you for taking the time to adventure with EMPIRICUS. Read more "Calm in Kotzebue"
Read more "Were outa here!" Empiricus is in the news! Read more "Empiricus is in the news!" Read more "Changing Seas, Changes what you See"
Boundaries are truly in the mind. As I lay in my bunk, I hear the water rush by my ear. Interrupted only by the hobby horse surge of the hull beneath me, the crackle of the fire, and the murmurings of my son, who plays in his bunk. We sail directly for Nome. Nearly halfway there now, we have sailed a single tack under ideal conditions through the Bering Sea. My Partner and lover happily at the helm . A loyal crewmember resting in his bunk for the next watch. This is a happy crew indeed. These are the moments that are freeze frame perfect. As I lie in my bunk to rest now, I will smell all the smells; the fire, the food, the sea. I will hear: the creaking and groaning of the rig, the splashing rumble of the sea and the subtly meanderings of my companions. I will look around at; the varnish and paint, the brass, the glimmering light from the portholes. I wrote this while underway in the Bering Sea last week and thought I would share what I felt. Read more "Today is Indepe…"